For our contact use only. Website will be linked on Ad Page. A link to your Facebook will be placed on your Ad page. A link to your Instagram will be placed on your Ad page. A Link to your Twitter will be placed on your Ad page. Address entered here is for billing info only. Check the contact information you would like to be visible to the public on your Ads. If you leave it unchecked, your information remains hidden. Your website, facebook / instagram links, and company descriptions, will be public by default. Please note that your private data and information will remain private to GCC at all times. This description is 94 characters or less, and will display on the Advertiser Directory image 'popup'. Let us know the business category(s) you would like to be listed as. Tags are the Keywords related to your business, used for searching. For example a boutique might be "fashion, clothing, gifts, shoes, jewelry". You may list up to 10 tags, separated by commas. Jpg, jpeg, gif, png, pdf are accepted here. If your logo is a different file type, leave this blank and we will contact you by email for a logo. We will use all images in a square format to fit our Advertiser Directory Format. If you have issues uploading, email images to [email protected] File size must be 32MB or less. We feature Interviews with the stars who run our Golden Featured Businesses. Interviews can be seen on our site's main page, and are featured on Social Media. Select here and you can bump your Business to the top of the line, and be our next Featured Golden Business! - An added Value Option. Interviews by Sharon Arena of Salty Red dog Marketing. News 12 and Gold Coast Connect will be featuring selected businesses to feature in on air featured spots for the News 12 local broadcasts. 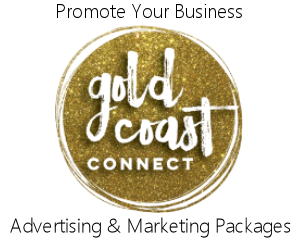 This option is available to local businesses who are part of our Gold Coast Connect Community. When you select "submit" below, you will be registered for your ad package and selected options.On submission of this form you will be directed to a PayPal web page for your Payment information. Because our Payment Plan includes a yearly recurring payment, you will be asked to login to, or to create a PayPal account. Payments can be made via a credit card, thru that PayPal account. If you require an alternative method, or an invoice for a check payment, please contact us. At no time will Gold Coast Connect store your payment information.